6930 Friday evening, Nov. 3rd : I had a carrier from 2240 UTC to 0007 UTC, with some music at 2309 UTC. No idea from where. Can anyone help him with these? As an aside, I also heard the carrier on 6930 kHz. I wondered at the time if this was Radio Pirana International . . . and I still do. Guess an e-mail is in order. . . . I haven't seen any reports of North American pirates being heard around 0600-0800 UTC last night (or European stations being reported over here in that time frame). Wonder if people are sleeping in and will report it later? LFR is reporting Baltic Sea Radio on 15085 kHz at 1220 UTC with a strong signal in the UK. I've been sitting on the frequency, hoping that something will come through, but I have a feeling that the only thing I'm going to get is the knowledge that I need a better antenna for 19 meters! Regardless, BSR is obviously making a long-distance test and I hope the station is getting out well (even if I can't hear it). Wolverine Radio (tentative): 6940U, 11/5, 2130 Music. How's that for a logging? If the Wolverine Radio is too weak for me, then maybe it's time for a more sensitive receiver! It really makes me wonder if something is seriously wrong with the sensitivity. Anyway, Wolverine was reported in England and on the continent. Channel Z was also testing on 6300 kHz around the same time. Wonder if anyone in Europe heard it because it looks like it should have made the trip. Speaking of making the trip, Johnny Tobacco, Enterprise Radio, Laser Hot Hits, and Radio Mexico were all reported. Also, from South America, Lupo Radio, Radio Compania Worldwide, and Radio Pirana International were all logged in the U.S. Great stuff! Both transmitters are on now. Wow, last night wound up being a bit better than I'd expected in eastern North America! Clever Name Radio and Dr. Detroit were both reported in England by a few listeners. I could even clearly hear CNR on the Twente web receiver in Holland, so hopefully a few other people in Europe tuned in as well. Also, when Cool AM was going to bed last night at 0355 UTC (! ), he heard a station on 6925 on the Twente receiver, so that was presumably a North American station. Going the other direction, Radio Enterprise from Italy made it across (or at least its carrier did) on 6950->6940, as well as Laser Hot Hits on 6205, and Johnny Tobacco's Radio Abu Dhabi, which had a pretty decent signal on 6285 kHz. Haven't heard much in terms of schedules today, although I did receive a schedule from a continental European pirate that will be on today from 1415-1630 UTC on 7720 kHz USB. That one probably won't be audible beyond Europe and North Africa, but those in other parts of the world can tune in via web radios. Radio Enterprise is active across Europe right now on 6950, so maybe it will be active around 2100-0100 UTC again? Baltic Sea Radio: 15050U, 11/4, 1305+ Chris Smolinski is getting some signal, but I never do well hearing BSR. I'm hearing it on the Twente receiver, but I've only thought that I've heard a tiny bit of audio on my own receiver. Not sure if I'm going to have any luck today. Clinic Radio: 6235, 11/4, 1504+ ID & address in English, but all songs so far have been in German or Dutch. I believe this one only plays medical-related music? Considering the late-night (in NA) signals, here are a couple more propagation pix. First, here's the same Harrisburg, PA, arrangement as shown in yesterday's post, except at 0600 UTC. There's a lot of faint signal spread across Europe and into Africa and South America. Although the signals have disappeared from most of Europe, they would actually be expected good in Ireland and parts of the UK. There also might be a shot at Japan. It seems that a station in the Northeast could do well between 0600 and 0800 UTC, but the question is whether anyone would be listening in those parts of the world? Dr. Detroit: 6955, 11/3, 2143+ pop music--I think mostly from the '80s. Dr. Detroit said the show was being broadcast via Radio Illuminati. Boston "Rock'n'Roll Band" Excellent signal. This is also being reported with a good signal in England! BTW, Dr. Detroit is a mostly forgotten movie. Here's the trailer. For the first image, I used Harrisburg, PA, as the location because it's the closest one to my location and that way no one will feel like I'm giving away their location. Here is 100 watts into a dipole about 30 feet above the ground on 14.1 MHz (essentially the same for either 13900-13950 kHz or 15010-15090 kHz). As you can see, a station with these specs should do very well into the deep South, Spain, western North America, all of Canada, and (whether or not anyone is listening) Greenland, the Caribbean, Mexico and Central America, and northern South America. Fairly similar, but a bigger 1st skip hole and a great shot at South Africa and maybe a weak signal into Japan, South Korean, etc. Of course, there's also a nice zone for Angola, Namibia, and the Sahara, but I've never seen any reports from those areas. I'm really encouraged by this because we've been hearing some stations from Europe the past week and although I'm sure that some of the variables are different (power, antenna height, mode, and location), overall this picture is bleak and it doesn't look like much anything would be audible in the U.S. or most of Canada. The fact that a few stations have been heard this week with better than average signals makes me think that actual propagation this weekend should be a bit better than what's shown here. The signal is surprisingly good, but we haven't heard any pirates using 57XX kHz or so lately, so we really don't have any real results to compare it to. Still, it looks like a Dutch station operating on these lower frequencies has the chance to have a great signal in all of Europe, parts of Asia, and still have a chance to be heard in northeastern North America. Something to keep an eye on. Not so great results for the Northeast, but as you can see, this looks great for anyone in the western half of North America who doesn't typically expect to log Europirates! Also, this looks good for DXers in Australia and New Zealand. Even though propagation looks challenging, it appears that propagation will allow plenty of opportunities to hear stations in different parts of the world.
. . . and runs through Sunday. Propagation has been good on 48 and 43 meters, as evidenced by last night's reception of Clever Name Radio across much of Europe. I'll try to be back later on today with some propagation forecast maps, etc. If I receive any schedules in the mean time, I'll post those, too. I follow baseball and football and tend to read clickbait articles, like “Winners and Losers from Week 8,” “The Worst Trades in Pirates History,” and “Minor League Free Agents, Round 1.” Reporting sports and writing about pirate radio are apples and oranges . . . or maybe baseballs and baluns. In general, the two are so different that almost no skills overlap. I won't get into why, but if people took the same approach to writing about radio as sports is analyzed an dissected, we'd have some angry hobbyists. That's not my goal. The end game here is just to give radio fans a little something extra to read. Some click bait or maybe low-brow reading about high tech. Halloween was a great time. 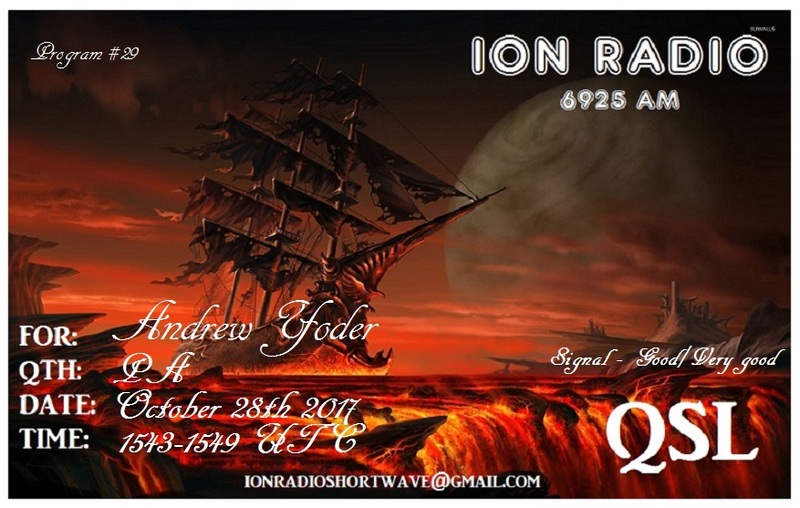 Lots of stations, big signals, fun programming, DX opportunities, etc. Thanks to all of the broadcasters who took the time, energy, and risks involved to entertain some shortwave fans. I dropped everything to listen on Halloween, which is more than I can say about even this year's World Series. I didn't make up a list of expectations for the holiday, but I did have some in the back of my mind. First of all, I did expect that some pirates would be on the air and it did happen. But a list of expected events that did happen would be boring, so here is a list of things that I expected to happen that didn't and a list of things that did happen that I didn't expect. No medium-wave pirate activity. I had a feeling that either some old AM pirate or, more likely, a current shortwave pirate would run a test on 1710 or 1720 kHz. Didn't happen. Almost no seasonal-only stations. Creepy Radio was it. 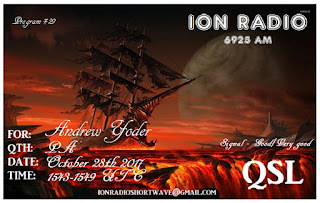 No Halloween Radio, Radio Halloween, Satan Radio, WAHR, The Count, The Ghost Shortwave, Great Pumpkin, Germany Calling, Witch City Radio, Pumpkin Patch Radio, or Voice of the Abnormal. Limited West Coast activity. I didn't see a bunch of listeners from the West, like I had seen in the past few years. Also, I didn't get the impression that broadcasts were coming from that part of the world. International pirates. The last time I remember hearing international activity on Halloween was in 1992, when it happened on a weekend and when we were having a Pirate Pages DXpedition and letting everyone know we'd be listening. Then, we heard Radio Pirana International from South America and Radio Silverbird from Holland. 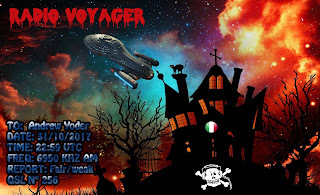 This year, Radio Voyager was reported by a number of listeners, Lupo Radio was on from Argentina, and Laser Hot Hits was easily audible. Voyager and Lupo both were on much later than normal. Shows above 80 meters. I'm sure that a number of casual pirate listeners tuning around 6925 kHz missed the activity, but WHYP and Radio Free Whatever were cranking on 4065 kHz for a number of hours with great success in terms of coverage and signal strength.